A classic American card game for many, Old Maid brings back memories of evenings sitting around the kitchen table and familiar faces. However, do you remember how to play Old Maid? You know you have played it but it’s been a while! It’s the game that introduced you to a playing deck. Or the one you remember because you liked finding the creases on cards and remembered that one card with the curly-haired Uncle. It made you feel sneaky and sophisticated. You fanned out the hand of cards neatly. Old Maid’s level of complexity and few rules means it’s a hit from generation to generation. 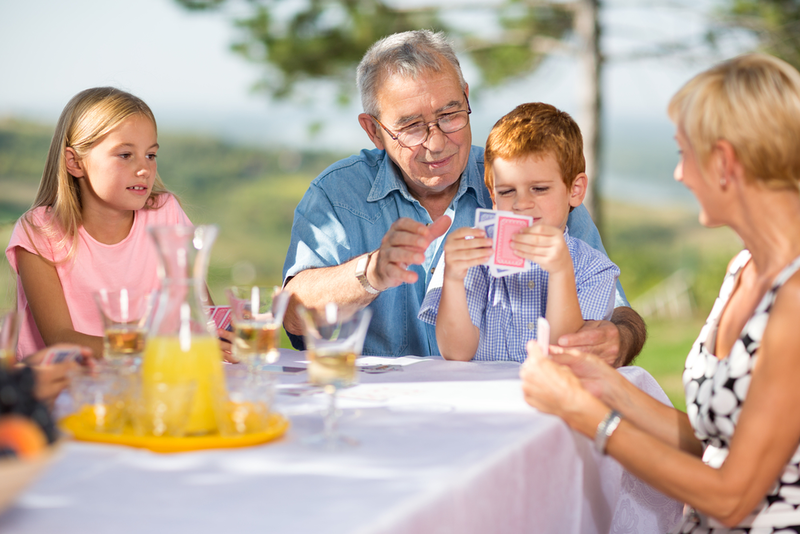 Its ease of play lends itself to mass appeal with children and grandparents alike. Old Maid is a great game to incorporate into a family game night, school breaks, or just a fun activity before bedtime, rainy days or camping trips. Besides its simplicity, Old Maid provides children a creative means to develop skills such as recognition, matching, pairing, and counting. Its lack of strategy is a key component in its approachability. Few card games exist that can engage such a wide audience. If it’s not already a family favorite, it just may be the next big one. To help refresh your memory, here we’ll talk about how to play Old Maid. Old Maid is a card game played with either a standard deck of cards or a specialty deck of cards often created to appeal to smaller children and to allow them to learn skills along the way. 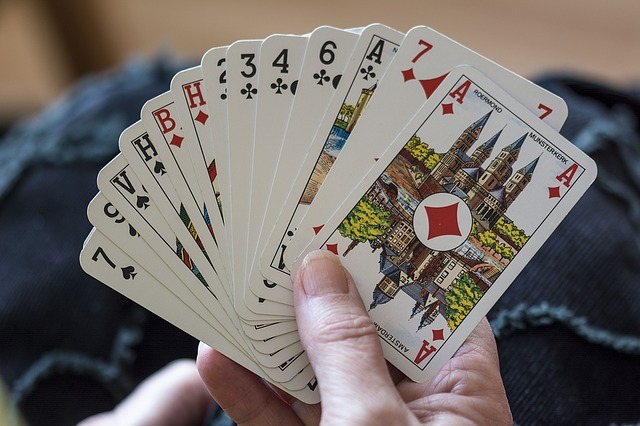 Unlike many card games, you can play Old Maid with just two players and conversely, there’s no real maximum number of players as long as each player gets a few cards. It is often a game used to sharpen the mind to patterns making it a great first game. You can buy the game Old Maid as a standalone deck at many stores. Filled with color and illustrations these decks often provide the feeling of a personal connection to certain characters and can spark a sense of wonder. The specialty deck has pairs of cards depicting characters from a fictional neighborhood or relevant household items rather than suits of four. They are captivating for younger children whose imaginations enjoy analyzing the images. Who will find the card? Who will play the investigator and guess who has her? Do you know how to play Old Maid using a standard deck of fifty-two playing cards? Choose one of the face cards to be the odd one out and remove one of the four cards so that two can be played as a match. That third card will be the Old Maid. Or have only one of that suit remaining. For instance, choose Queens, and remove the Queen of Diamonds from the deck. The Queen of Hearts will be the Old Maid, and the Queens of Spades and Clubs can be played as a match. Or leave out the Queens of Spades and Clubs altogether. Old Maid goes by many names and is popular in many places around the world. In Germany it’s known as Schwarzer Peter and in Sweden as Svarte Petter, translating to Black Peter. In France it’s Vieux Garcon or Le Pouilleux, Old Boy. These days it is also called Pass the Lady, Cuckoo, or Chase the Ace. Ready to learn how to play Old Maid? The goal of the game is to not be left holding the lone card that does not make an even pair at the end of the game. Alternatively, the number of matches a player makes can be counted at the end of the game to determine who has collected most. The player who runs out of cards first is the winner and the player with the Old Maid loses. A dealer is chosen and should deal out the entire deck so that each player has a set of cards. Before play begins the first action in the game is to designate a dealer among the players. You can do this in a variety of ways. The method of selecting the dealer is up to the participants. Have everyone draw a card from the deck, the lowest card chosen will be the dealer. Or flip a coin to settle ties. Choosing a dealer can be one of the most fun parts of the game. Draw players in by offering a chance at being the first to be the dealer. After the dealer hands out cards, only look at your own cards. Note: Each player may not have the same amount of cards. Someone will have an extra card, and that’s okay. The next rounds will be dealt so that players receiving a card more can receive a card less next time. The loser of the last game can be the dealer of the next game. Have players organize their cards and discard any pairs of the same rank or number. For example, if a player sees two Sixes or two Kings they would pair them together and separate them from the ones they are holding in their hand. This is done regardless of suit. If a player has three of one type of card, they would remove two and keep the remaining card without a match. These matches are out of play. The first player to the left of the dealer offers their cards fanned out and facing down to the person to the dealer. That player selects one card at random to find a match for a card in their hand. If it pairs with any of their existing cards, then those two cards are removed and discarded. Remember, don’t show your cards to your neighbor, you don’t want them to see your cards and know which to pick! 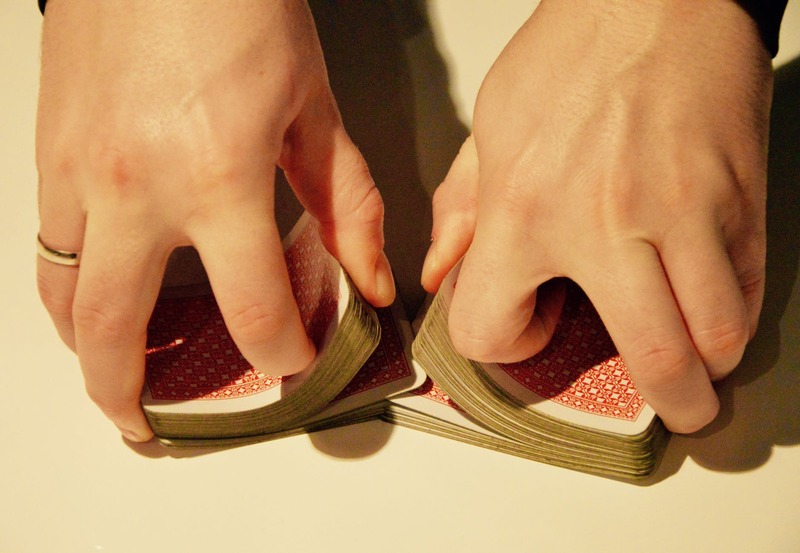 If the selected card does not make a pair, the player adds the card to their hand and the card would remain in play for the next round of selection by the player to their left. Whether the player drawing a card discards a pair of cards or keeps an extra card in play doesn’t change the next step of game. The next player will then do the same as the person before them and offer their cards fanned out and facing down to the player to their left who will select one at random. Again, once the player has selected the card, they will see if it paired with any of their existing cards and discard that pair. If the selected card does not make a pair, the player would add it to their set of cards and the card would remain in play for the next round of selection by the player to their left. This cycle will continue with a player selecting a card and discarding a matching pair or incorporating it into their stack of cards, then offering their cards to the next player to their left until all the cards are gone except for one. Towards the end of the game, as people run out of cards by making their pairs, players may take more time to choose. It gets tense. There will only be two players. One will have two cards and the other will have only one. At this point it, these two players can agree which one will make the final draw. Or it can be a rule that the single card holder always chooses from the player holding two cards. Either the person selecting a card or the person holding cards could have the Old Maid! There are variations to the game and math challenges you can incorporate once you’ve mastered how to play Old Maid. Old Maid decks often have likeable images that draw in attention and keeps children engaged. Variations to conventional ways on how to play Old Maid can promote and bolster comprehension and processing skills. For example, a typical specialty Old Maid deck will contain only pairs with an old maid card. You can turn this into a fun and challenging memory game by placing the cards face down individually side by side and having children trying to match cards by turning up two cards at a time and then replacing them. Another variation is to lay the cards face up one at a time and have all participants try to tap the Old Maid card. The person who can tap the old maid card before the others get all the cards that are touching the old maid. You can continue to do this until the deck gets picked up. Have children look at the symbols on a deck of card. Teach them the suits of a standard deck. Let them notice which suits have which color and ask them how many of each kind there are. For the youngest ones, relating the image of an aunt or uncle can help to promote the memory of their names and faces. You I can create even simple multiplication games using cards. Draw two cards for a fast round of multiplication. Collect as many cards as you can. Or for complex math comprehension skills make a three by two rectangular shape of cards. What’s two times three? Six. If you count up the cards in the rectangular shape, that’s six too. This is how multiplication works. Two rows of three. Three rows of two. It’s the same. Six. After reading this article, we hope you have a better understanding of how to play Old Maid with your friends and family. Now you can enjoy playing the classic game or come up with a fun variation yourself!